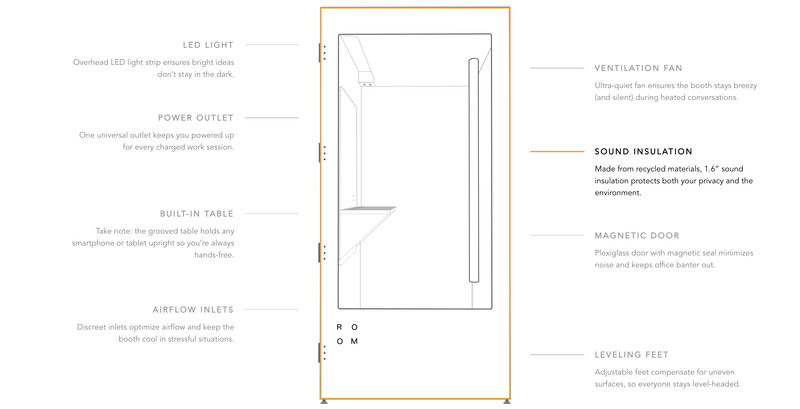 Room is a new company that’s created private, semi-soundproof phone booths for noisy, crowded offices. Room says they’re on track to sell $US10 million worth of product in their first year of business. If you work in an open office, it’s likely that you’ve ducked into a hallway, a closet, or even the bathroom to get a few moments of quiet to make a phone call. While Room was originally born to accommodate the ever-changing, scrappy dynamic of the startup office environment, in the company’s first few months of operation, they have snagged some bigger clients as well. NASA, Nike, and Salesforce are all among Room’s first clients. Already, says Meisner-Jensen, Room is on track to sell $US10 million worth of phone booths by mid-2019, at about $US3,500 a pop. It’s already something of a soundproofed success. But it started from relatively humble origins. “We had huge issues with noise in our office so we tried to fix it ourselves,” said Meisner-Jensen. “It was much more difficult and expensive to build than we expected,” said Meisner-Jensen. Once the booth was constructed, Meisner-Jensen realised there was one fatal flaw within its design: While private and relatively quiet, it was also extremely hot inside. Meisner-Jensen soon realised that his office wasn’t the only one that was in dire need of a small, quiet space for making a quick phone call: Noise and a lack of privacy are a common complaint within the modern workplace, where open communication is often encouraged. The booths are assembled upon delivery within a matter of hours. They’re made from a blend of recyclable materials including a padding of plastic water bottles inside the walls themselves. At 10 square feet, they’re snug, but not cramped. Meisner-Jensen and Chen have designed the booths with crowded office spaces in mind: They’re insulated with noise-cancelling materials to keep out unnecessary sound and sealed by a magnetic door. Ample provisions have also been made to moderate the space’s airflow: vents in the floor and ceiling keep the temperature moderate, and a small ceiling fan prevents against over-heating. 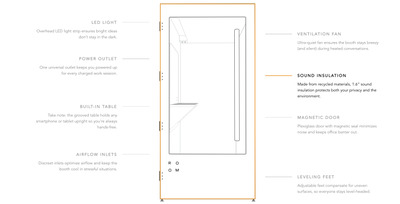 Room’s booths are expressly designed to accommodate video conferencing and phone calls. To discourage longterm use, Meisner-Jensen and Chen incorporated a stool to sit on, rather than more comfortable options like a bench or a chair, which might encourage people to camp out for hours. However, Meisner-Jensen points out that just about everything about the booth’s design can be customised for larger orders. Room’s booths are designed for short term use to accommodate video conference calls and private phone conversations. For now, the company is struggling to keep up with the overwhelming demand for their buzzy new product: Meisner-Jensen said it can take about 2 months for an order to be delivered from Room’s furniture production facility in Portugal. However, he stresses that production time will decrease dramatically in the upcoming months: Soon, Room hopes to deliver its product in about three weeks flat. The booths, said Meisner-Jensen, are only the beginning of Room’s plans for the future of the office space. 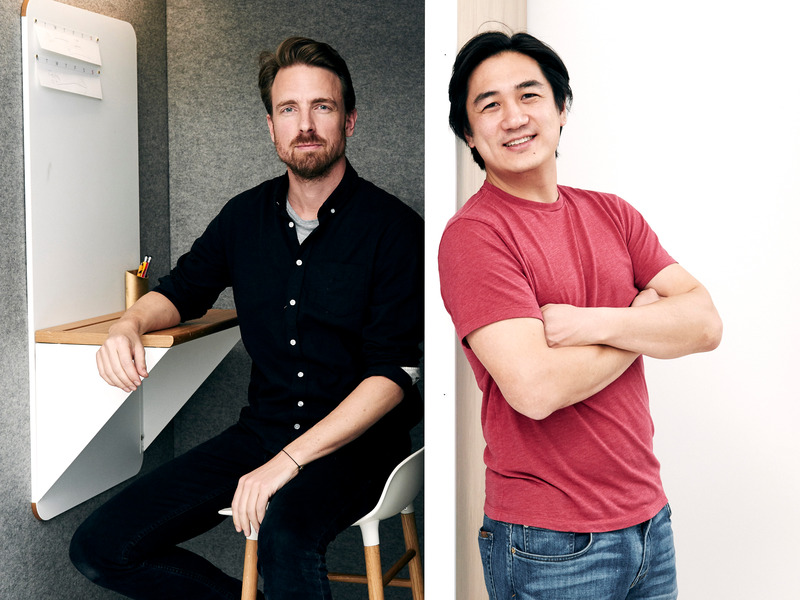 Meisner-Jensen envisions Room’s ambitions as closer to that of mattress delivery company Casper than furniture giant IKEA: Room wants to position itself as a direct-to-consumer solution for office spaces and provide easy-to-assemble furniture for affordable rates.